Looking for hotels near Isola Bella? Featuring a terrace with panoramic sea views, Maison Blanche Taormina offers rooms with air conditioning and heating. The bed and breakfast also has a guest lounge with elegant decor. Featuring views of the Mediterranean Sea and Mount Etna in the distance, Hotel Villa Carlotta is 5 minutes' walk from the center of Taormina. Isola Bella Apartment offers pet-friendly accommodations in Taormina, 164 feet from Isola Bella and 1640 feet from Mazzaro. The 5-star Belmond Villa Sant’Andrea offers a lovely setting overlooking the Mediterranea Sea, just a 5-minute drive from Taormina’s center. Located within a 5-minute walk of Isola Bella and 500 yards of Mazzaro Sea Palace in Taormina, Suite Adalgisa provides accommodations with free WiFi and flat-screen TV. 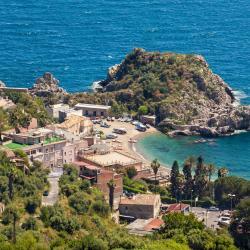 65 ft from the beach on Isola Bella Bay, Panoramic Hotel has access to Taormina by cable car. All rooms and the outdoor swimming pool have Mediterranean Sea views. Hotel Villa Diodoro boasts a hillside position and an outdoor pool with panoramic sea views, a 5 minute walk from the historic center of Taormina. This was my fourth stay at Hotel Villa Diodoro. And it was great. Hotel Villa Esperia is set right on Mazzarò Bay, only 328 feet from the cable cars which will take you right into Taormina’s picturesque historic center. Staff was very friendly and helpful; we were given a very nice upgrade into a suite. Family-run Villa Astoria has a garden and panoramic sea views just 1640 feet from Taormina's historic center. 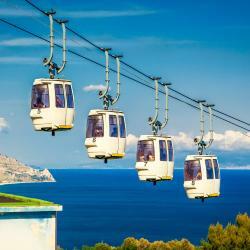 The hotel is 2 minutes' walk from the cableway to Mazzarò and Isola Bella beaches. The staff, the room and the views were amazing. The 5-star Belmond Villa Sant’Andrea offers a lovely setting overlooking the Mediterranea Sea, just a 5-minute drive from Taormina’s center. I loved the bath salts. The sweet staff at the front desk. Overlooking Taormina's Mazzarò Bay, Jonic Hotel Mazzarò is an Art Nouveau building located only 98 feet from the funicular to the center, and near the Baia di Isola Bella beach. The location was great. Close to the beach. Personnel were very friendly and helpful. 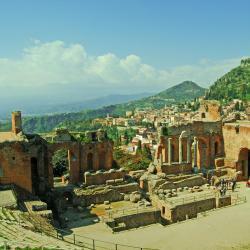 Set on the east coast of Sicily, Garden Hotel is just 164 feet from the sandy beaches of Taormina. It features a lovely relaxing garden with tables, chairs and sun loungers. Perfect location for beach and the gondola (3 euro) to old town. 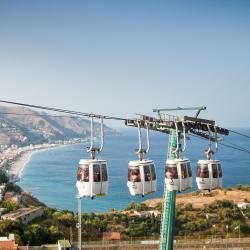 Mendolia Beach Hotel is located on the seaside of Taormina, just 328 feet from the funicular to the historic center. All rooms offer a balcony with views of the Isola Bella Bay. The staff was very helpful when one of our party (group of 6 - three rooms) was sick. Hotels with great access to Isola Bella! La Pensione Svizzera is a classic, small and charming hotel. Owned by the Vinciguerra family since 1925, it is located on one of the most beautiful, panoramic roads of Taormina. Great location and good breakfast. Grand Hotel San Pietro features an outdoor pool and sun terrace, overlooking the Ionian Sea. 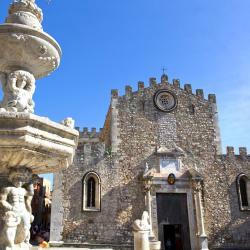 Taormina's historical center is a 15-minute walk away. Location was amazing. Short walk up stairs or free shuttle you can arrange with hotel. Just a 3-minute walk from the cable car down to Taormina Beach, Grand Hotel Miramare features panoramic views of the Ionian Sea. Set in lush gardens, it offers a pool and tennis courts. 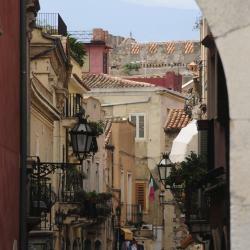 Location good as you are close to buses and the tram down to Issa Bella. A 10-minute walk from Taormina, Bel Soggiorno is an elegant 3-star hotel boasting panoramic views of Mount Etna and the Mediterranean. Excellent views of Mt. Etna and the ocean. Very nice grounds and location. the island is great, views are amazing. This is one of the sites I regret having missed out in seeing. It came highly recommended by my host as a nature reserve worth seeing. I would recommend that one would make time in their itinerary for a visit. People are talking about Isola Bella! Explore guest hotel reviews featuring "Isola Bella"
Parking in Taormina was insane so the biggest bonus was the limited parking behind the hotel. Before trying to find parking on your own cue up outside the hotel and go in and ask for the voucher and directions to their parking. The beach outside the hotel is Mazzuro Beach which is great, but you need to walk further up the street to get to Isola Bella which is, in my opinion and I've been to Taormina 3 times, the most beautiful and best swimming in all of Sicily. This hotel was a breath of fresh air after the other places we stayed in Sicily. They really care about service and the happiness of their guests. We had to have our room change and it was no problem. Breakfast was wonderful and the location is to die for. 15 minute walk to the lift that takes you up the mountain and 25 minute walk to the island - Isola Bella. They also have a area on the beach specifically for their guests to use, it's wonderful. Incredible value! Very clean and comfortable hotel with spectacular view of Isola Bella and excellent location! Staff is very friendly and professional. My room was tiny but had a balcony with breathtaking view! The road did not bother me at all. Breakfast was wonderful. Like I said, great value for your money. Apartment was really lovely, the photos do not do it justice. Views of the beach from both bedrooms. Really good location, literally 2 minutes form the beach and easily accessible to town and Isola Bella. T host also lovely and always available when we needed information. Would highly recommend. Our apartment had a huge balcony, with an amazing view of the sea and Etna. You can have breakfast there (included - coffee, croissant and yogurt). Very close to the stairs for Isola Bella (great location) and the center. The room ad the bathroom were big and clean. Amazing location to Isola Bella & Cable Car. Apartment is super clean, comfortable, & made me feel at home. Emanuel provided amazing service & communicated with me the entire time. Great rental, highly recommend. I will be back.